Immense sharklike Fish of the South Pacific Ocean. Etymology: Possibly from a Melanesian (Aus-tronesian) word. Physical description: Gray above and white below or entirely pale white. Length, greater than 30 feet, perhaps up to 100 feet or more. Distribution: South Pacific Ocean off eastern Australia. 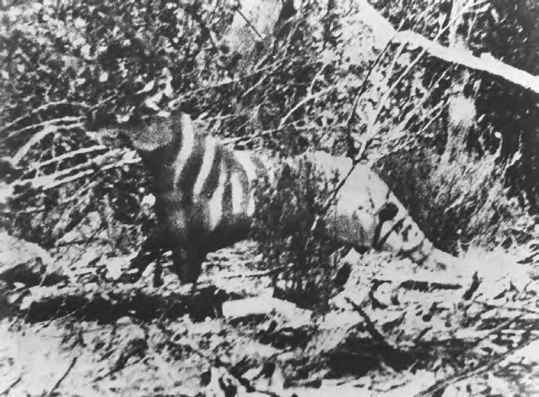 Significant sightings: In 1918, fishermen in deep water near the Broughton Islands, New South Wales, Australia, watched as a gigantic, "ghostly white" shark made off with their crayfish pots. Their estimates of the animal's size ranged from 115 to 300 feet long. Novelist and fisherman Zane Grey saw a yel-low-and-green shark, 35-40 feet long, near Rangiroa Atoll in French Polynesia in 1927 or 1928. In 1933, he and his son saw a similar shark, perhaps as much as 10 feet longer, in the same area. (1) The spotted Whale shark (Rhincodon typus) probably accounts for Zane Grey's observations. (2) Outsize specimens of the Great white shark (Carcharodon carcharias), which averages 14-15 feet long. Individuals more than 20 feet long exist but are extremely rare. An unconfirmed 37-foot great white shark was found trapped in a herring weir at White Head Island near Grand Manan, New Brunswick, Canada, in June 1930.
large enough to swallow an entire cow, and its triangular teeth were 4-6 inches long. Sources: Vadim D. Vladykov and R. A. McKenzie, "The Marine Fishes of Nova Scotia," Proceedings of the Nova Scotian Institute ofScience 19 (1935): 17-113; David G. Stead, Sharks and Rays of Australian Seas (Sydney, Australia: Angus and Robertson, 1963), pp. 38-47; Gerald L. Wood, The Guinness Book of Animal Facts and Feats, 3d ed. (Enfield, England: Guinness Superlatives, 1982), pp. 129-135; Michael Goss, "Do Giant Prehistoric Sharks Survive?" 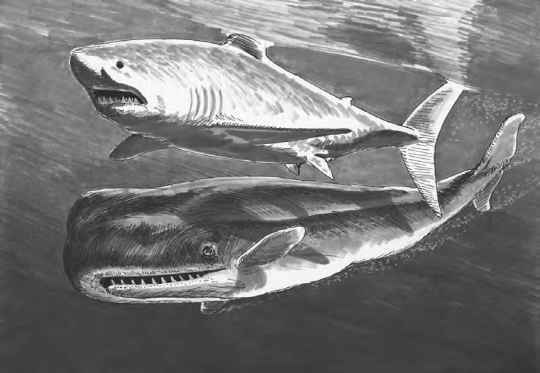 Fate 40 (November 1987): 32-41; Karl Shuker, In Search ofPrehistoric Survivors (London: Blandford, 1995), p. 123; Ben S. Roesch, "A Critical Evaluation of the Supposed Contemporary Existence of Carcharodon megalodon," Cryptozoology Review 3, no. 2 (Autumn 1998): 14-24.